An unmanned private spacecraft is set to launch from Virginia Wednesday (Sept. 18) on its maiden trip to the International Space Station. If successful, Orbital Sciences' Cygnus spacecraft will become the second private robotic American cargo ship to dock with the orbiting laboratory. The first was the Dragon capsule, built by billionaire Elon Musk's California-based spaceflight firm SpaceX. Orbtial Sciences' first Cygnus spacecraft is scheduled to launch toward the space station Wednesday at 10:50 a.m. EDT (1450 GMT). You can watch the Cygnus spacecraft launch live on SPACE.com Wednesday, courtesy of NASA TV. How does it get into space? Cygnus: Orbital Sciences' vehicle will fly into space atop the company's Antares rocket, which is expected to launch from Pad 0A at the Mid-Atlantic Regional Spaceport at NASA's Wallops Flight Facility in Virginia on Wednesday at 10:50 a.m. EDT (1450 GMT). The spaceflight firm launched the first Antares test flight in April, but Wednesday's liftoff marks the debut of the fully functional Cygnus. Antares is about the size of a 13-story building, standing 131.5 feet (40 meters) tall. The two AJ26 engines used in the rocket's first stage are based on the NK-33 engine, which was originally developed to launch Russia's giant N-1 moon rocket — the Soviet answer to America's famous Saturn V — in the 1960s. However, the Soviet heavy-lifter was never launched successfully. 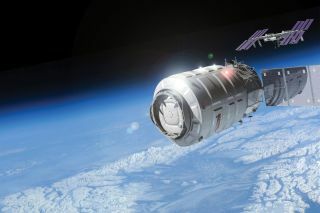 Orbital Sciences is contracted for eight cargo missions with Cygnus and Antares under a $1.9 billion agreement with NASA. Wednesday's launch kicks off a demonstration flight designed to see if the company is ready to begin these contracted supply runs. Dragon: The Dragon capsule — named for the fictional "Puff the Magic Dragon" in the song by the folk trio Peter, Paul and Mary — is launched to space using SpaceX's Falcon 9 rocket. While Antares' design is modeled after a Russian rocket, the Falcon 9's Merlin engines are new. The two-stage rocket stands taller than Antares at 224.4 feet (68.4 m), and it can lift 28,991 pounds (13,150 kg) into low-Earth orbit. The Falcon 9 first stage has nine Merlin engines. The rocket can lose up to two of these engines and still finish a mission, SpaceX officials have said. SpaceX designers were inspired by the Saturn V, "which had flawless flight records in spite of engine losses," officials said. SpaceX is contracted to fly 12 missions to the space station using Dragon and the Falcon 9 under a $1.6 billion contract with NASA. Already tested as a cargo carrier, the Dragon spacecraft can also be fitted out to shuttle passengers to low orbit and to the International Space Station. See how SpaceX's Dragon capsules work in this SPACE.com infographic. Cygnus: Orbital Sciences has designed two Cygnus vehicles for different purposes. The standard configuration of the spacecraft's cargo module will have the ability to carry up to 4,409 pounds (2,000 kg) of cargo, while the enhanced version will carry up to 5,952 pounds (2,700 kg) of material, company officials have said. The mission Wednesday will use the standard configuration and is expected to deliver 1,543 pounds (700 kg) of supplies to the space station. This Cygnus is 17 feet (513.6 cm) tall and will remove up to 2,425 pounds (1,100 kg) of disposable cargo from the station when it leaves about one month after docking. Dragon: SpaceX's capsule can carry up to 13,228 pounds (6,000 kg) of supplies to the International Space Station. It became the first private American spacecraft to deliver supplies to the orbiting outpost and return cargo back to Earth during its demonstration mission in May 2012. SpaceX has also already completed two of its 12 contracted supply runs to the International Space Station. Dragon is scheduled to make its third cargo trip for NASA in January 2014. How do they come back from space? Cygnus: Once the Cygnus spacecraft undocks from the orbiting lab, it will burn up in Earth's atmosphere. Engineers on the ground will guide the capsule into a "destructive re-entry" above the South Pacific Ocean, according to Orbital Sciences officials. Dragon: SpaceX's ship is the only spacecraft flying today with the ability to return substantial amounts of cargo to the Earth from the International Space Station, company officials have said. The capsule can safely return 6,614 pounds (3,000 kg) of supplies, experiments and other material to Earth. The last Dragon to dock with the International Space Station splashed down in the Pacific Ocean off the west coast of Mexico on March 25 with more than 3,000 pounds (1,361 kg) of cargo aboard. NASA will hold a press conference today at 2 p.m. EDT (1800 GMT) to discuss Wednesday's Cygnus launch to the International Space Station. You can follow that briefing live on SPACE.com, as well as the launch. SPACE.com partner Spaceflight now is also offering updates via its Cygnus Mission Status Center, which will also include a launch webcast.